New York Fashion Week is only two weeks away, can you believe it? For bloggers and influencers, NYFW is THE place to discover and show off the latest trends, network with brands, and take some killer photos. 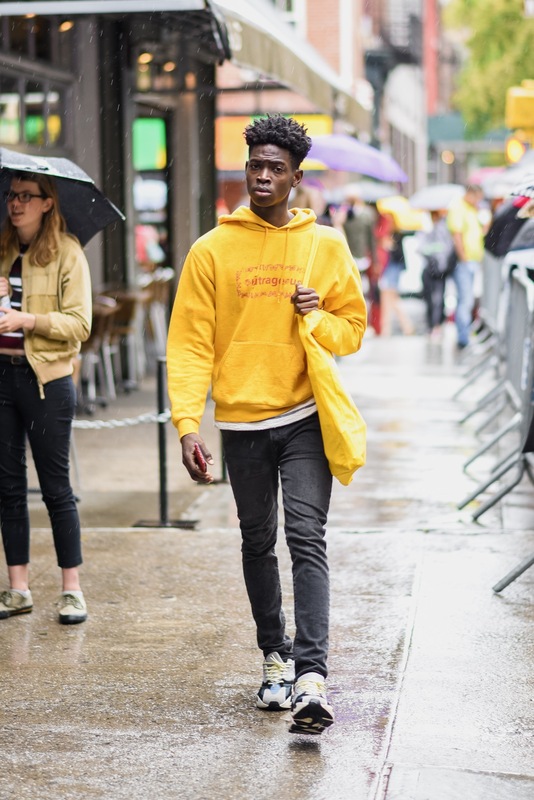 One of the most coveted shots of NYFW is the street style shot that looks like it’s straight out of Vogue. But how can you achieve this photo? 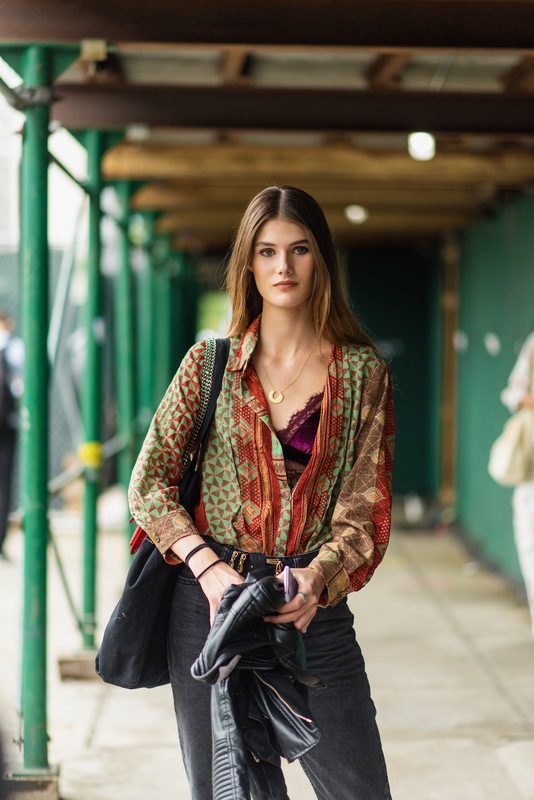 By being spotted by a NYFW street photographer! 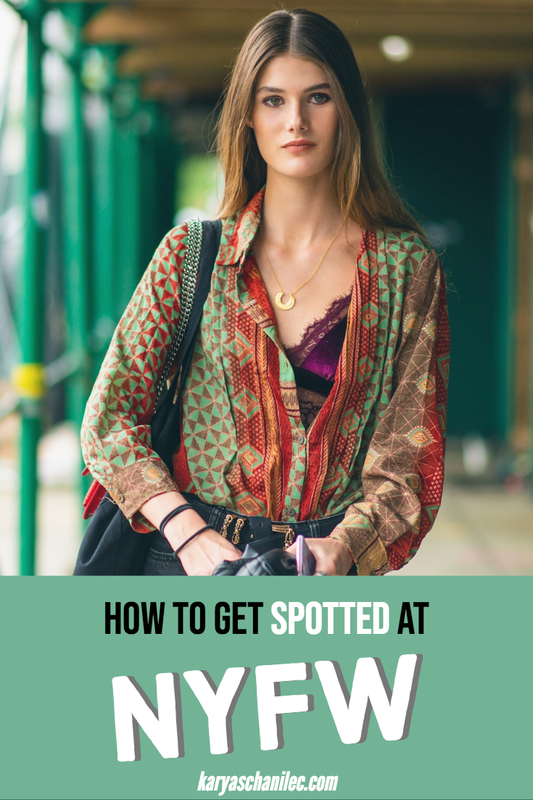 I’ve shot street style at New York Fashion Week for the last two seasons, and have gathered my top tricks and tips for how to get spotted at New York Fashion Week. NYFW is all about the top fashion trends, but also showing off your individuality. 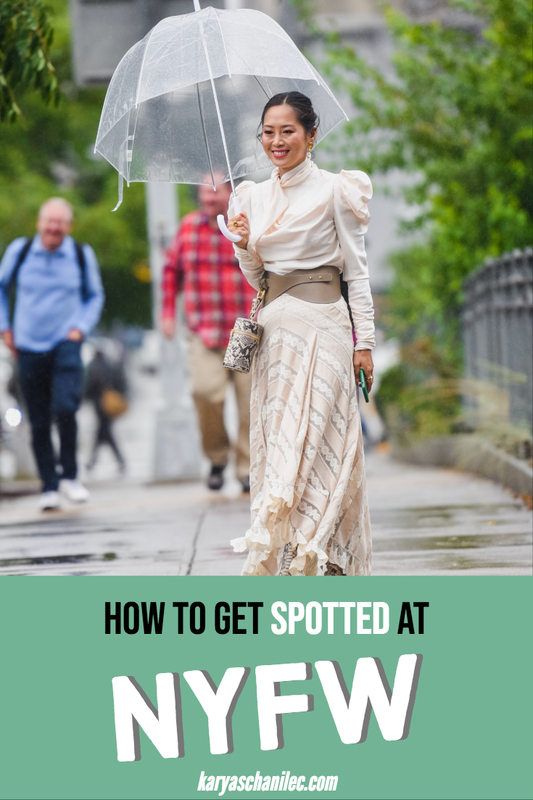 At fashion week, anything goes, and sporting a look that stands out will get you spotted! Street photographers are looking for the most fabulous of a particular item or trend, so pack those items in your closet that will turn heads. That being said, stay true to your own style and wear outfits you feel confident in – see tip #4 on how confidence will help get you spotted! Some of my favorite outfits from September were popular trends with a unique spin, like Scarlett Halo’s twist on trendy chunky sneakers with nostalgic light up versions. Timing is everything when getting spotted by a street photographer. Most photographers show up 30 minutes before a shows start time to catch the attendees who arrive early, and stay 15 minutes after to capture the fashionably late. There are perks to being early to shows – you are more likely to get a seat and you can network while waiting in line. However, there will be less photographers around and it’s harder to get good photos of people standing in line. If you arrive fashionably late (or even right on time), you have a better chance of making an entrance (see tip #3). However, you risk the venue hitting capacity or the show starting without you. Arrive 30 minutes before the show start time to scope out the area. Are there photographers? If not, take a lap or two around the block until there are photographers actively snapping. If a huge line isn’t forming once there are active street photographers, separate yourself from the crowd and hangout outside of the line. See tip #4 for ways to stand out when hanging out. There are two ways to arrive at a show venue – walking up by foot, or rolling up in a car. From a street photographer perspective, there are right and wrong ways to do both. Walking up – if you’re arriving by foot, take a page from Song of Style’s book and maximize your exposure by walking a distance. For the Zimmermann show last season, she walked two blocks to Spring Studios which resulted in more photographers being able to capture her. Have your ride drop you off a block or two away from the venue entrance, or walk from the subway. Also, arrive from the correct (translation: most photogenic) direction. The venues have natural runways that street photographers will congregate around, so use them! For Industria, arrive from the south walking up the sidewalk or in the street. For Spring Studios, arrive from the north through the infamous scaffolding. Rolling up – if you’re arriving by car, opt for an iconic yellow cab or one of the official NYFW cars, get ready to perform as soon as your step out (see tip #4), and take your time. This method works best 10 minutes or less before a show start time when street photographers are most active. While this method is not very conducive with the technique I outlined in tip #2, you can still arrive early via car to chance getting spotted that way, and take a lap around the block if not. I often get asked “what the heck am I supposed to do when I walk up to a show?” The answer is – PERFORM! While the models are walking the runway inside, you’re slaying the street outside. Walk with confidence – that means head up, shoulder back, with your best smile or smize. If you’re stepping out of a car outside the entrance, get ready to be in front of the camera as soon as that door opens. Pose – if a photographer starts snapping you, stop and pose for them. I can assure you they will love it, and may even give your directions. Squad – rolling up with a squad of fashionable friends will definitely catch the eye of street photographers. If you coordinate your outfits, even better! Fake phone call – I learned this from blogger Austen Tosone! If you feel uncomfortable posing or just don’t know what to do with your hands (don’t we all? ), whip out your phone and make a fake (or real) phone call! This will give you a boost of confidence walking up to a venue. If you pose for a photographer, talk to them! I love when I actually connect with the people I shoot on the street. Trade info (business cards, emails, or Instagram handles) so you can get the photos from them, or even schedule a shoot! Are you headed to NYFW in February? Comment down below!